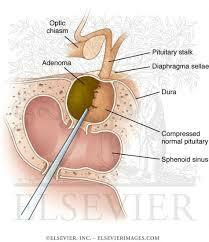 Pituitary tumors, both secretory and non-secretory may need removed, whether they are benign or malignant. Since secretory tumors may lead to disease, since they produce excess hormones, they must be treated successfully with medications or they will require removal via pituitary resection. Even some non-secretory tumors may need removed, depending on the size and location of the tumors. 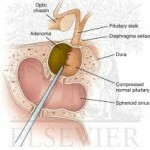 Generally, a pituitary resection removes the tumors transsphenoidally, which involves going through nose and the sphenoid sinus to access and remove tumors. In rare cases, a craniotomy may be needed if the tumor cannot be removed transsphenoidally. Surgeons often use endoscopes, microscopes or both during these surgical procedures. Once the tumor is accessed, generally currettes can be used to remove them. This involves cutting the tumor into small pieces before removal. However, in some cases, removal of larger tumors may require two different operations – one to remove the first part of the tumor and the second to remove the rest of the tumor after it falls into the sella, allowing it to be easily reached. When a pituitary resection is performed, one common risk is damage to the pituitary gland. Damage to the gland may result in the need for hormone replacement therapy after surgery, which could include the replacement of testosterone, cortisol, estrogen, human growth hormone or the thyroid hormone. In some cases, damage to the back of the pituitary gland may cause diabetes insipidus, although doctors use medications to control the condition successfully in most cases.